During the past eight years, I’ve spent hundreds of days and thousands of car miles traveling in Northeast Brazil—the region extending from the state of Bahia in the south, to the city of São Luís in the north. Everyone has their favorite city in the Northeast, the most popular of which include Salvador, João Pessoa, Maceió, and Natal. But Fortaleza stands out among its peers, and easily has the broadest appeal among the Northeast’s cities. For a property buyer, it has everything you could ask for, from elegant, beachfront living to chic city neighborhoods, in one of the world’s best places for full-amenity city living. The city—along with its surrounding beach destinations—has been a major draw for foreign residential investors. And it’s also a hub for Brazilians, Europeans, and North Americans seeking a second home, drawn by Fortaleza’s fine sandy beaches, great weather, and rich lifestyle. And tourism plays an important role here, too. Fortaleza is one of the most visited cities in Brazil for international tourists and is frequently the number-one destination in Brazil for Brazilian tourists. Granted, none of us are looking for tourists, or tourist annoyances. But it pays to remember that tourism became popular here because of the fantastic weather and beaches, which run for an amazing 16 miles (25 km) in the city. And when you think of city beaches, it’s unlikely that you’ll picture these beaches, with their fine white sand and turquoise waters. And once tourism got a foothold, it brought along five-star hotels, fantastic restaurants, luxury accommodations, and sizzling nightlife…all of which, in turn, bring more tourism. Just this year, Fortaleza is hosting events that run from the now-ongoing World Cup to the Miss Universe contest…and events like this are responsible for the upgrading of Fortaleza’s modern infrastructure. All this serves to enhance the values of the properties here, and to create a strong rental market. Capital of the state of Ceará, Fortaleza claims to have the best weather in Brazil—a claim also made by about a half-dozen other cities up and down the coast. But competing claims aside, the weather is about the best I’ve seen here. The wet season is roughly from February until June, with the driest months being July through December. The average high temperature in December—the warmest month—is 87°F (31°C) while in the “coldest” months it plunges all the way to 84.4°F (29.1°C). Fortaleza is a large city, with more than 2.5 million people in the city proper and around 3.5 million in its metro area. Looking at the skyline from across the bay, its glistening buildings stand in sharp relief against the deep blue skies, fine sandy beaches, and blue waters. The city’s palm-lined beaches are all open to the public and well maintained. The seaside boardwalk is cheerful and bustling day and night with joggers, strollers, and swimmers. It hosts one of the region’s best artisan handicraft markets, with hundreds of artisans showing their wares. I’ve spent many hours and plenty of reais in this market buying quality items for friends and family members. The mouthwatering seafood restaurants vary in character, from rustic tables and umbrellas in the sand to fine dining overlooking the water. The main in-town beaches of Fortaleza are Praia Meireles and Praia Iracema. The boardwalk runs along the length of both and at the south end you’ll find the fisherman’s market where the fishermen pull their boats up on shore each morning to tempt you with the day’s fresh catch. Praia do Futuro—easily the most popular beach in the area—lies at the south end of town, with its wide beach, coconut palms, and fine white sand. A few blocks inland, you’ll find attractive tree-lined streets, parks, and homey neighborhoods with fine dining, sidewalk cafes, and modern shopping malls. Here, in neighborhoods like Aldeota, you also have a wide range of residential choices from tasteful houses to bright condo towers with their clean, modern lines. I never paid much attention to the neighborhoods back from the beach until a local colleague moved from a beachfront location to Aldeota in order to enjoy the quieter ambiance and community feel. His move gave me a new appreciation for life away from the boardwalk. In addition to the beachfront districts and the classy inland neighborhoods, Fortaleza also maintains its original historic center which I found to be quite colorful and well kept. I’ve always enjoyed visiting this usually overlooked area and spending a few hours looking at the architecture and shops, as well as visiting its huge central market known as Mercado Central. All in all, Fortaleza boasts a combination of lifestyle choices that’s pretty hard to beat in one city. Now and then both Praia Meireles and Praia Iracema are plagued with annoying vendors cruising the boardwalk. We once found it impossible to enjoy dinner in a seaside outdoor cafe due to the stream of vendors, one of whom took a seat right at our table. This doesn’t happen all the time, but you’ll see it now and then during the peak season. Also, at certain times of the year the wind becomes strong off the ocean, and some may find it objectionable. A modest apartment in an older building in Aldeota will start at about R$275,000, which is US$120,500 at today’s exchange rates, or US$1,205 per square meter (m2). As you approach the ocean things get more expensive…and of course if you go to a less desirable area, they get cheaper. Just 50 yards from the beach, I found a two-bedroom apartment, with each bedroom having its own private bath. It has 80 m2 (860 square feet) of living space and comes with two garage spaces. The asking price is R$450,000 (US$200,900). In Aldeota, a second-floor apartment in a somewhat-older building had three bedrooms, three baths (one in the master bedroom), two garage spaces, and a maid’s quarters. The size is 125 m2 (1345 square feet) and the asking price is R$360,000 (US$160,700). And here’s a top-shelf option, dead on the beachfront, with broad ocean and beach views. The apartment is a large 240 m2 (2,580 square feet), with 3 bedroom suites. The master suite has a dressing room and two private baths, while in the other two bedrooms you have to rough it with only one private bath. The floors are marble, and the trim is tropical hardwood. Best of all, it’s turnkey…the apartment comes with high-end furniture, cabinetry, and appliances. The building amenities include a gym, sea-view swimming pool, an event room, game room, and sauna. 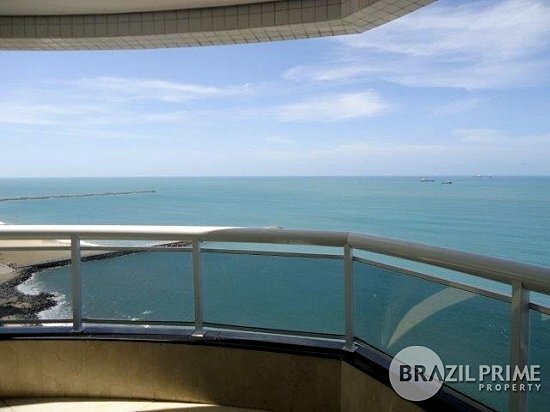 The asking prices is R$1.2 million (US$535,700). At just US$2,232 per square meter, this is one of the best beachfront deals you’ll find. Check out the views, below. To look at real estate in the area, stop in at Brazil Prime Property ( http://www.brazilprime.com/en/default.asp ). They’re at the waterfront on Avenida Beira Mar 3960, #12, (Edificio Via Scala). You can write to Paulo Nobre at paulonobre@brazilprime.com. 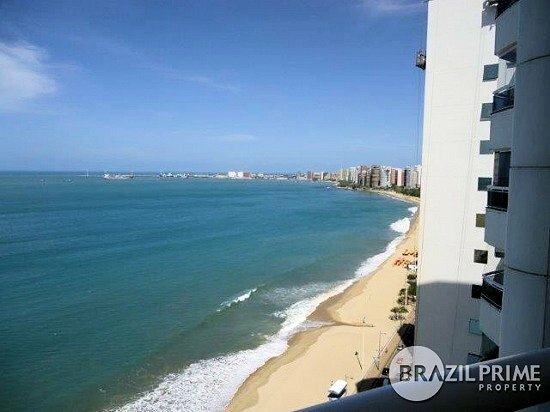 If you like big-city, beachside living, Fortaleza is tough to beat. You’ll be hard-pressed to find better weather in coastal Brazil, and the in-town beaches are convenient, clean, cheerful, and well appointed. While the food is amazing throughout Brazil, Fortaleza cuisine still manages to stand out. The Churrascarias (Brazilian barbeque) are a staple where you can enjoy succulent meats carved right at your table. And equally notable are the hundreds of fine seafood restaurants. You’ll also find Italian, French, and American cuisine served in first-class establishments. The properties are an especially good deal right now thanks to the current strength of the U.S. dollar against the Brazilian real. And the rental market is still strong for tourists and business travelers. 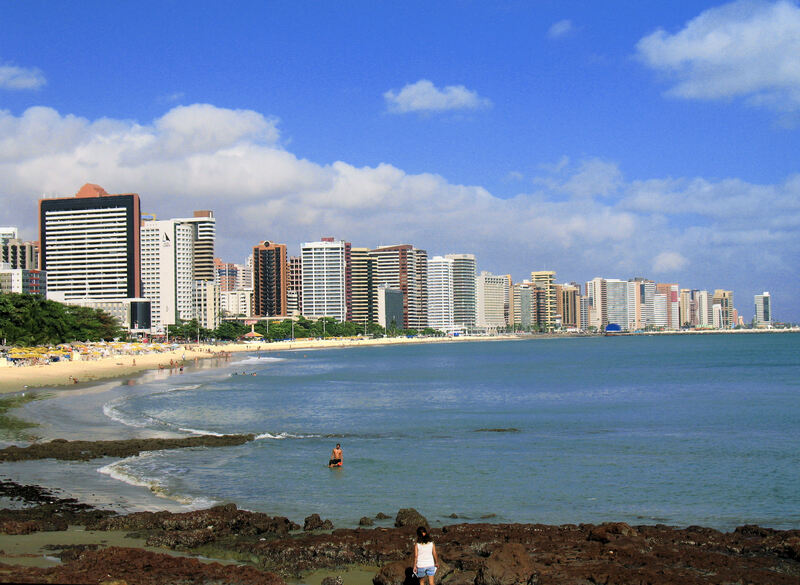 For city living in Brazil, Fortaleza is definitely worth a close investigation. After reading a few of your newsletters referencing the many real estate opportunities throughout South and Central America, I was wondering about the feasibility of developing land for personal use. Specifically, I’d like to know about the availability of building lots, what it costs to build per square foot, and the availability of local skilled trades and building materials. Personally, I think building instead of buying is a great idea, and my experience has been very positive in Ecuador, Uruguay, and Brazil. It’s a way to build-in a lot of value with a smaller investment, because generally, the cost of labor and materials is low, compared to the price of the finished product. And I’ve never had a problem finding skilled trades or quality materials. The local construction methods, however, may be different from what you’re used to. So try not to be too directive until you’re familiar with how things are done. Also, make sure you specify everything you want a contractor to do in writing, because the normal included items or standard terms will differ. Finally, my advice is to be there while the work is going on, unless you have a trusted associate who knows your standards for quality…perhaps another expat. If you just hand a project over to a local craftsman or contractor, you’re sure to find unwelcome surprises when you return. Are there any restrictions or special requirements for Canadians when buying property in Brazil? Does one have to be a Brazilian citizen to buy property? Are there any considerations with respect to Brazilian taxes? What currency are the transactions done in? Brazil treats foreigners and citizens equal under the law. There are almost no restrictions on foreign ownership of real property, and exceptions are few and very specific. For example, there are restrictions that apply to a person who is acting on behalf of a foreign government. Also, there is a restriction on the purchase of rural agricultural land by foreigners. Under a law that took effect in 2010, the size subject to restriction varies from one municipality to the next. If you’re considering buying any rural land that could be agricultural, it’s imperative that you have your attorney check to be sure there are not restrictions on the purchase in that area or that you’re within the restriction, if it exists. You can own beachfront property, but you’ll pay a nominal annual tax for the privilege of doing so. Also, there’s a transfer tax on beachfront transactions. On an ongoing basis, property taxes are small by North American standards. Finally, all property transactions in Brazil are in Brazilian reais. You can legally pay outside of Brazil in another currency, if you’ve got a buyer and seller who agree to do so.